“The most important thing with the project for me is the mentoring that I will be receiving, as having a contact from a professional environment will really give new light on what to expect once education is over. 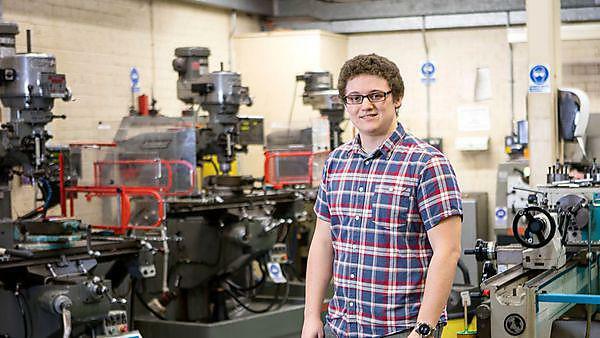 Benjamin is a second year mechanical engineering student at University of Plymouth. He was selected as one of the four highest achieving, disadvantaged students across 29 engineering courses to receive support from the Tamar Engineering Project (TEP) in its pilot year. “When I first found out I’d been offered a place on the project, I just remember feeling elated… I feel that this project will really help me develop both professionally and personally by helping me become more confident in my abilities. “Encouraging and helping the next generation of engineers when the country needs good qualified engineers has to be a good thing, as is a strong relationship between a company and its local university. The Tamar Engineering Project benefits both sides and I’ve found mentoring a student a very rewarding and refreshing experience”. Nick’s expertise will give Benjamin a remarkable opportunity to apply his theoretical knowledge into real-world practice, whilst building on Ben’s confidence, professionalism, networking skills, and an understanding of the industry and the opportunities within. It is thanks to support from businesses like SC Group, and from TEP champion Stephen Ball that the Project is up and running. Nick, Stephen, and other industry supporters offer their time and money to invest in the next generation of conscientious engineers. If you would like to express your interest in the Tamar Engineering Project please contact the Campaign team on +44 1752 588045.